Coaches know what it takes to win, and use every available resource to reach their goals on the field. We want to help protect you financially off the field. We have extensive knowledge of NFL, NHL, MLB and NBA contracts. Being a coach, instructor or trainer means that you are with your players every step of the way, keeping them focused and encouraging self-confidence, positive attitudes, and commitment. Both you, as a coach, and your players endure long hours, tough training and conditioning, with extensive drills to help fine-tune skills. As a couch, it is your job to help your players build physical, as well as mental strength, so that they feel like winners regardless of the scoreboard. Your major concern should be for your players’ and team’s success, and not about your financial liability or flaws in your insurance policy. That is why it is important to have your own personal or general liability insurance that will protect you in circumstances that may not be covered in your current contract and insurance policy. 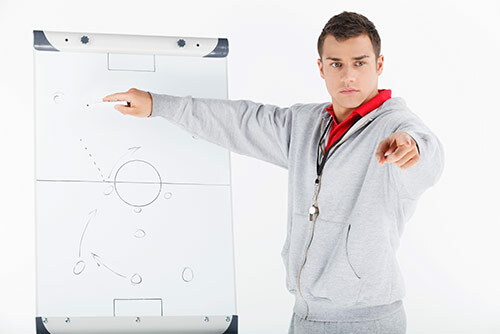 Liability insurance is specifically designed to protect coaches, instructors and trainers that directly supervise an individual or a group/team against any claims that could be caused by unexpected incidents that occur within their operations. General liability coverage protects coaches in the event that they may be legally obligated to pay for damages to others’ property or for bodily injury to others that is a result of their sports-related skills instruction. Professional liability provides coverage for wrongful acts that occur as a result of your coaching or instruction, such as neglect, omission, error, breach of duty, or a misleading statement in the discharge of sports-related skills training or instruction. Many coaching certification training organizations, like the FLAG coaching certification for NFL coaches, offer General Liability insurance as a benefit. This benefit acts as a safety net in case the sports organization doesn’t provide its own insurance, or if the sports organization’s insurance policy has unacceptable exclusions. Though this benefit through the coaching certification training organization seems to cover all the bases, it can be detrimental to think so. Coaches should still acquire their own General Liability insurance since both insurance policies through the certification training organization and the sports organization still have exclusions that can result in no coverage in certain circumstances.